What is interesting about this object is not so much its function – as you’ll soon learn, it’s a common enough type – but its location. It throws light on the history of one antiquity’s most famous buildings and what happened to it after the “decline” of Greece and Rome. But be patient, we’ll come to that. If I tell you that the item belonged to a religious context, I am sure you can guess which particular faith it is associated with. 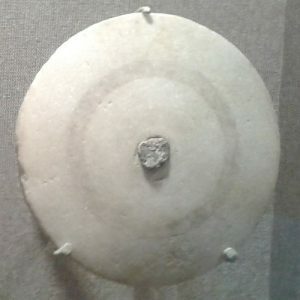 Indeed, the slab is an example of a typical feature found in early Christian churches. 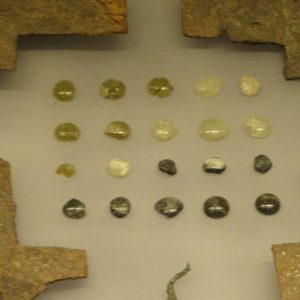 Christianity was first tolerated and then established within the Roman Empire in the 4th and 5th centuries AD, to become one of the dominant aspects of the Eastern Roman or Byzantine Empire. 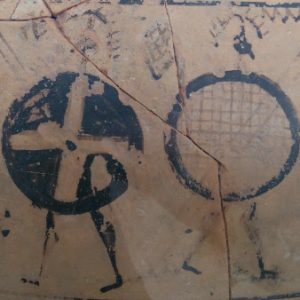 The Athenians and their contemporaries did of course not so much lose their religion as replace it (but that would not make a good title for a great R.E.M. song). In parallel, a standard architectural and decorative “vocabulary” for the new faith developed. Most of the Late Roman or Early Byzantine churches were basilicas with three or more parallel aisles, normally entered from the West and usually featuring one or several semicircular apses at the Eastern end. 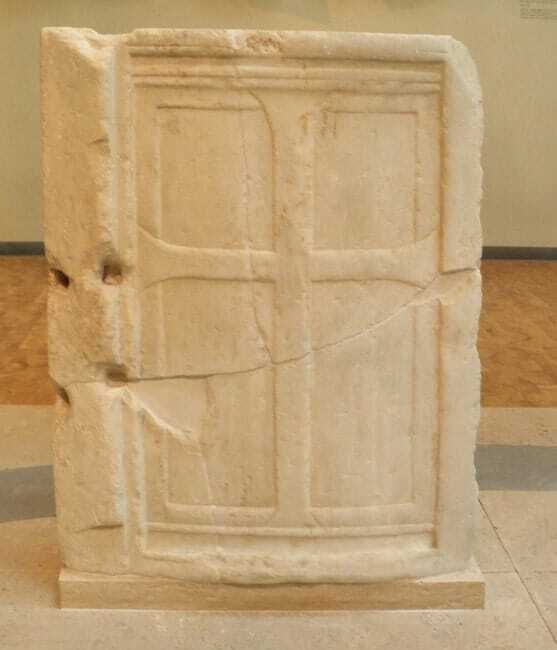 The altar, near the Eastern terminal, was separated from the place where the congregation assembled by the templon or altar screen, typically a simple stone barrier carved with patterns or Christian motifs. Other typical furnishings included the altar and – often – an ambo, an elevated pulpit for the homilist or preacher to be more visible and audible to the flock, also decorated with Christian motifs such as crosses. 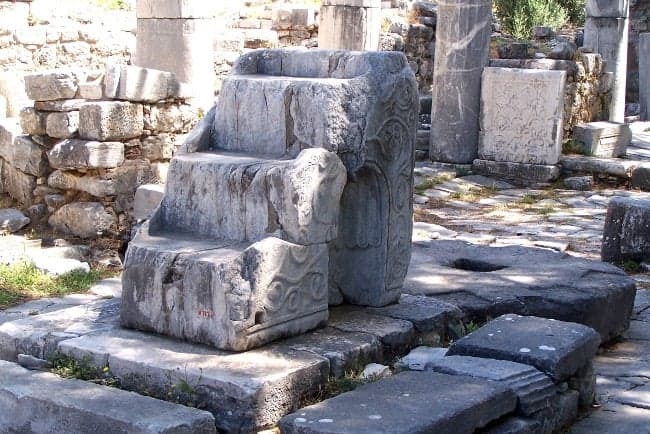 We see such church furnishings on most of our tours in Greece or Turkey, e.g. at Olympia, Messene, Priene, Knidos and Kaunos. Obviously, our piece is part of such furnishings, and experts have identified it as part of a 5th or 6th century ambo – but which early church might it have stood in? The answer is: in the Parthenon. Of course, that enormous building, one of the most famous architectural achievements in world history, was designed and constructed on the Athenian Acropolis much earlier, in the mid-5th century BC, as a temple to the goddess Athena, decorated with elaborate sculpture and housing an enormous gold-and-ivory statue of the deity. So, what is an evidently Christian church furnishing doing in a pagan temple? That’s not much of a puzzle: towards the end of antiquity, as Christianity became the newly dominant religion, many ancient temples were repurposed as churches. 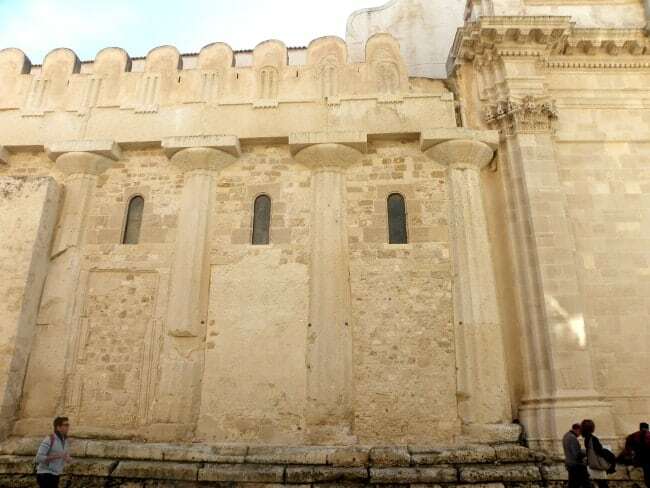 Another example of a converted ancient temple: the medieval and Baroque cathedral of Siracusa (ancient Syracuse) on Sicily, built into and over the Classical Temple of Athena. This entailed major and minor modifications to these buildings, including the Parthenon: as Greek temples are usually entered from the East and blocked off to the West, whereas Christian churches are oriented in the opposite way, a door had to be broken into the sanctuary’s western wall, while its monumental original doorway was blocked off with an apse. At least some of the pagan decorations, such as the pedimental sculptures showing the ancient gods must have been removed wholly or in part, and the furnishing necessary for functioning as a church, including our ambo. That is what makes our object so interesting: it stands witness to these changes and to the Parthenon’s long history as a Christian church, ensuring the famous building’s substantial survival throughout the ages and protecting it from quarrying and vandalism for the longest time. Such reuse was by no means untypical: other ancient temples preserved by such conversions include the superb Temple of Athena/Church of the Virgin Mary in Syracuse and the Pantheon/Church of St. Mary and the Martyrs in Rome. More modest perhaps: part of the ambo, carved with vines, in an early basilica church at Priene in Ionia (Turkey). The Parthenon, having served the cult of Athena for about 900 years (the date of conversion is unclear, it could be anywhere between the mid-5th and the late 6th century), remained one of the city’s central places of worship, existing as a church – and a major pilgrimage destination – for another millennium (from the 13th century onwards in the Latin rite, as Athens had fallen under Western control). With the Ottoman conquest of 1458, it became a mosque, once again preserving the structural integrity of the building. The Parthenon’s current ruinous state is the result of the great explosion of 1687, a side effect of the Siege of Athens during the Sixth Ottoman-Venetian War, followed by the removal of much of its remaining architectural sculpture over a century later. 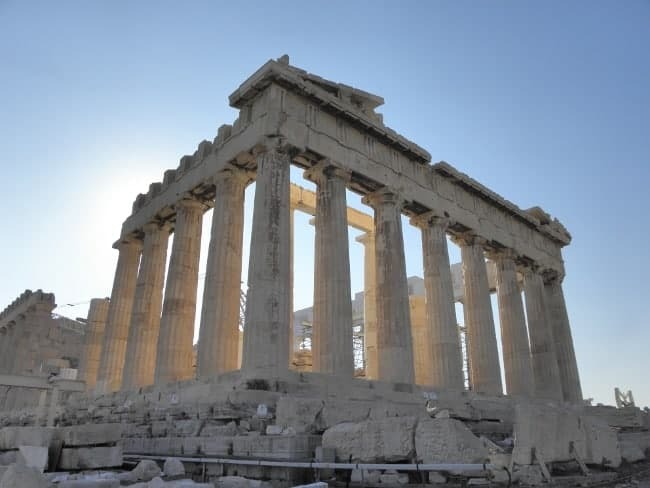 The current restoration works at the Parthenon and its presentation on site as well as in the Acropolis Museum focus – rightly or wrongly – on the “original” pagan Parthenon. To get some insight into the long history of the Christian Parthenon, and the oft-neglected but fascinating cultural and political developments of Byzantine Athens and Greece it witnessed, you need to visit the city’s superb Byzantine and Christian Museum. You can do so, with expert guiding, on our Athens tour tour, which introduces you to all of that great city’s history – of course including a tour of the Acropolis to see the Parthenon itself!